Dr. Vorys received his Medical Degree from Columbia University College of Physicians and Surgeons and completed his residency training in Orthopedic Surgery at the New York Orthopedic Hospital at Columbia University Medical Center. His fellowship in sports medicine and shoulder surgery was completed at Massachusetts General Hospital. Throughout his career Dr. Vorys has cared for athletes at all levels from high school to professionals. As a fellow, he was an assistant team physician for the Super Bowl-winning New England Patriots, Boston Bruins and Boston Red Sox. He also provided care at two area colleges– Curry College and Suffolk University. As a resident, Dr. Vorys was an assistant team physician for the North Bergen High School football team, City College of New York Athletics and Columbia University Athletics. Dr. Vorys is an active member of the American Medical Association, the American Academy of Orthopaedic Surgery, the American Orthopaedic Society for Sports Medicine and the Arthroscopy Association of North America. Dr. Vorys is dedicated to providing compassionate and individualized care to each of his patients. He ensures they are fully educated about their condition and helps them pick the treatment course, whether non-operative rehabilitation or reconstructive surgery, aligned with their symptoms and goals. 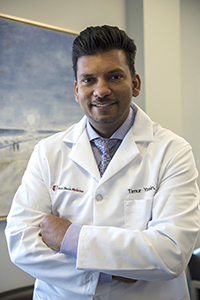 Dr. Yasin is a highly specialized Interventional Pain Management/Rehabilitation Physician. He is experienced in Interventional Pain Management, Ultrasound Guided Injections, EMG/NCV Studies and Sports Medicine. He believes in working with each patient and educating them about their course of treatment and providing individualized care. He understands that pain management and rehabilitation are unique to the patient’s symptoms and expectations and takes the time to ensure that his plan aligns with that of his patients’. Yasin attended medical school at SUNY Downstate Medical Center and completed his residency at NYHQ/Columbia University and SUNY Downstate Medical Center where in his last year of residency he served as Chief Resident. After his residency, Dr. Yasin completed a fellowship in interventional pain. Dr. Yasin is a member of the American Academy of Physical Medicine and Rehabilitation and the New York Society of Physical Medicine and Rehabilitation. Dr. Kenneth Glass has retired after over 30 years of serving the community. He earned his Bachelor of Science degree from City College of New York, and his medical degree from the St. Louis University School of Medicine in Missouri. He continued his training with an Internship and Residency in General Surgery at New York University/Bellevue Hospital in New York City. Dr. Glass then went on to a Residency in Orthopedic Surgery at Mt. Sinai Hospital and Elmhurst City Hospital in New York, where he was selected to be Chief Resident. Board certified in Orthopedic Surgery, Dr. Glass has been in private practice since 1986. He has served as Attending Staff Physician in the Emergency Room at St. Catherine of Siena Hospital in Smithtown since 1977, and maintains privileges at St. Charles Hospital in Port Jefferson as well. In addition, Dr. Glass is an Assistant Clinical Professor of Orthopedics at the State University of New York at Stony Brook. Dr. Glass is a Fellow of the American Academy of Orthopedic Surgeons and International College of Surgeons and a member of the New York State Society of Orthopedic Surgeons, Suffolk County Medical Society, Eastern Orthopaedic Association and New York State Medical Society. He is also the author of numerous articles that were published in peer-reviewed medical journals.